procedure BellmanFord(list vertices, list edges, vertex source) // This implementation takes in a graph, represented as lists of vertices and edges, // and fills two arrays (distance and predecessor) with shortest-path information // Step 1: initialize graph for each vertex v in vertices: if v is source then distance[v] := 0 else distance[v] := infinity predecessor[v] := null // Step 2: relax edges repeatedly for i from 1 to size(vertices)-1: for each edge (u, v) with weight w in edges: if distance[u] + w < distance[v]: distance[v] := distance[u] + w predecessor[v] := u // Step 3: check for negative-weight cycles for each edge (u, v) with weight w in edges: if distance[u] + w < distance[v]: error "Graph contains a negative-weight cycle"
As with Dijkstra, this is an actual game using the algorithm. I’m using Strategy in order to implement the actual runtime selection. 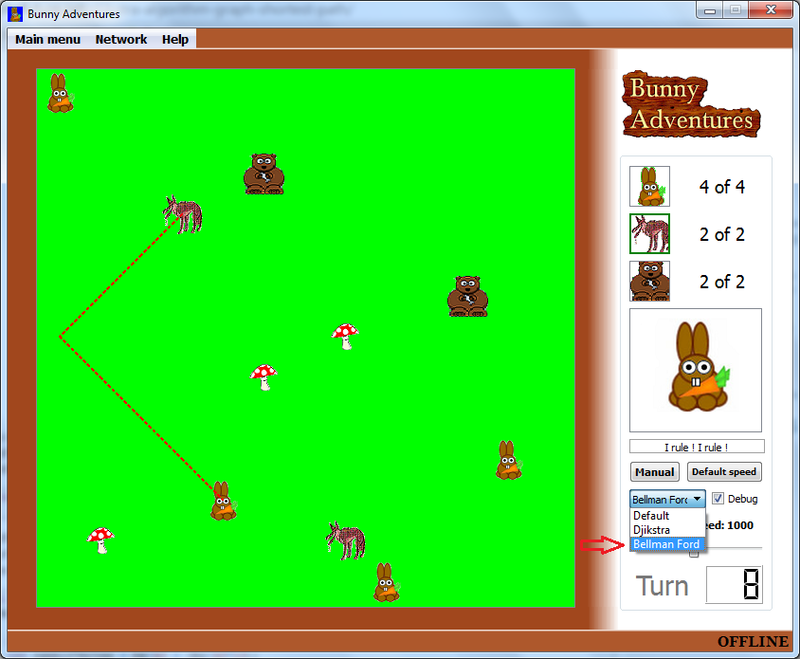 The interface is very similar to the one used with Dijkstra. The following is the actual implementation of the algorithm. distances - vector that contains the distance to every vertex from the source. The index of the element is the destination, while the value is the actual path cost. previous - this vector contains the actual shortest path. The index is the vertex, and the value is the vertex before it in the path. The other part of the algorithm – the BellmanFordShortestPathTo function – is a supportive function that returns the actual shortest path vertices. The first input parameter is the target vertex, while the second is the previous output parameter from the main algorithm function. Again, it’s up to you to modify the code above to improve readability and maintainability according to your needs.